Magento has a the feature to create rules in the Shopping Cart. It's cool but it's not cool enough. What I wanted to do is to set a surcharge for one payment method. I needed to add a charge in PayaPal method. So I found the way you can set negative discounts (what means a surcharge) in the cart total price. Note: we are going to change Magento Core files. Please make a backup of your files before continuing. 3. Translate the discount word. If you select this option the code above will not work entirely. Read this comment below to learn how to fix it. Interesting, I’ve been using magento quite a while now and I’ve been unable to make some kind of discounts. Problem with this solution is upgrades, as always. Are you using the 1.4 version? The discounts works great in the last version. Thank you for that. I used your example to create a custom setup fee for items that are imprinted with customer logos. This becomes upgrade proof if you place these changed files under the app/local/folder so as not to overwrite the core code. CJ, if you are doing imprints, can we talk? I am doing silk screen T-shirts & embroidered polos and having a tough time allowing people to meet a minimum order using different sizes, then applying a discount for total quantity. Why wouldn’t it add 12 + 12? I figured it out. If I make the rule under “conditions” and the again under “actions” it works. Maybe I don’t need the rule in “conditions”? I’m a bit confused as to what the difference is. Exactly what I have been searching for – thank you! My customer needed a fee for cooled products. It’s ridiculous that Magento only supports the discounts. In my opinion a so called “price rule” should be possible in both ways. Unfortunately my translation doesn’t work. I updated the app/locale… directories as in your example and the locale files of my template. Did you cleanned (refresh?) the caché? Yes, I did. Several times. There are no additional characters (I know this can cause problems – evil german language), nothing special at all. The correct german word for discount is being used, but that’s it. I checked all the csv-files in both directories, but nothing changes. Maybe you’re changing something wrong. Maybe I was wrong (at least it worked for me in a Magento 1.3 version). Yes, it’s 1.4. I read some rumours, that some of the translation files could be somewhere in the database. Anyway, I’ll run some tests now. Thanks again. Thx. 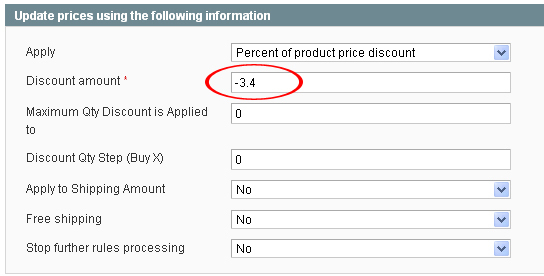 It really works to allow input the negative discount amount in actions of Shopping Cart Price Rule. But after saved the rule, the negative discount amount works for “Fixed amount discount” but fail for the “Fixed amount discount for whole cart”. I’ve tested both work for positive discount amount. I’ll try to look at it if I have time. I’ve the same problem of oginome. currently I try to modify the way of catalog rules. I made the changes to the corresponding files for catalog rules and i was able to use negative amounts….but….e.g. I have a product ‘A’ with a price (normal) of 30.00. When a special customergroup is logged in the price should be 35.00. So I made a rule which have -5 as discount amount. But it looks like when the price is higher than the normal then always the normal price is shown. Is there a way to allow higher prices? Maybe you should set the normal prize to 35 and add the -5 discount for all non X-Customer-Group. yes, this is the last option 😉 But it would be much nicer when i can use the rules, cause when the “extra fee” change, i have to change all related product prices…. I had the same problem, I needed a fixed fee for the whole cart. I’m afraid you have to do some core-hacking here (again), because there is a nice little if, that prevents a negative discount. Gets interesting at the “cart_fixed” case. “if $cartRules[$rule->getId()] > 0)” etc. If you simply change it to “<" your negative discount will work (and nothing else). That's the quick'n'dirty way. Everything in tax and fees is dirty in Magento. PD:It works for me on 1.6.1.0, hope Magento improves all these in future releases, other apps in the market all ready have this kind of features. Hi, i’m working on an extrafee like this, because i have a category “frost food” that need an extra fee for special container that cost 15€. Please note: do not override the files, but copy them under local with the same structure!!! This is working well, but what i want to do now is: add an extrafee every (example) 5 item in the basket. Let’s say, if you have only 5 frost food, you need only a container, if you have 10 items, 2 containers, and so on. Another problem i have (but this is minor) is that is i have extrafee i can’t have discount or viceversa, because it do the sum and this is not clear to customers. Hi Nicola and thank you for you comment. In the other hand there is a condition “Total Item Quantuty is….” maybe you can use that condition in addition to the other one. I’m sorry I’m not helping so much. I have a post on the magento community too, hoping someone can help. Is there a way to add a single flat fee to the whole order in the shopping cart? I’m afraid if I change the code as you suggest my hundreds of other price rules won’t work? I have a $50 set up fee that I originally added to the configured product but I only need to charge it one time. If they order two or more products, they keep getting hit with another $50. The code I posted should not conflict the normal rules. It just remove the imitation for negative discounts. thanks for posting this, just what ive been looking for.. thx!!. Also im looking for a solutions for an “extra” discount line in the cart and on sales emails, so both fee and discounts are specified in the cart, as postet by Nicola, if i find the way, ill post it, as this can be quite a problem…. Found it. i changed the file /app/design/frontend/blank/default/template/email/order/items.phtml. BTW, this is also the file where you can changes the layout for the last “handle” in the order trans. mails. Thx for leading the way…. Thank to you for the tip! NOTE… this ajustment will mess up the “total sales” on the dashboard in Mag. backend…. Still works for us as we dont use this…. This is a great post thank you. I made it work in no time on the shopping cart price rule but how do I make it work on the catalogue price rule. I need a set up fee adding up to every item and not only to the final price of the shopping cart. I see your problem, however i dont have a solution for this. I hope you find your way. So I’ve made the modifications noted in this post, but magento still tells me I cant have negative numbers in the percentage field, any idea why that may be? I’ve actually come across the problem of making changes and not having them be reflected in the system. Do you know why this could be? Do you have the Cache ON ? No, Cache is off right now because I had not finished modifying my store. Ok just followed steps to ensure that cache is flushed, that indexes are up to date and make sure compilation is disabled, I still get the error message. i use Magento ver. 1.3.2.3 and i have a problem with a shopping cart price rule. 1.i make a rule name for single client with discount 10% off with some coupon code. 4. When i’m going to admin area i see this rule name is inactive….. It does’t work for my shop (Manento 1.4.1.1). The rule applies fine when a user is logged in (it seems that the last payment option is remembered). For a new customer (or a customer who hasn’t logged in, there’s a error message saying the product can’t be put in the shopping cart. Looks like the shopping cart promotion does’t work if the payment method is unknown. This actually works fine with me using Magento version 1.6. However when I use Paypal to checkout then redirected to Paypal account page, it still shows “Discount” and it minus the subtotal (instead of adding). Any idea how to manipulate the Paypal stuff? Have you looked for an extension ? That’s very helpful, however for my case, i need to add a shipping choice for the buyer. There maybe a checkbox on the checkout page to allow buyer to pay for insurance or not, is that difficult? I think there’s an extension somewhere to add a field to the check out process. That allows to customize the fee title/description/percentage/amount and a checkbox in checkout process. The code I posted it doesn’t always work as expected. Have you considered using an extension ? I use this for the extra fee in paypal payment method. All is OK but when the store redirects to paypal, this doesn’t add the % and it discounts. found the way to make paypal add the discount. search for all “TOTAL_DISCOUNT” and where there is a “-” change for a “+”. It works for me because i don’t have any more discounts actually. Thanks for the Top Lnk! It will allow you to upgrade the Magento Core without losing your changes. The term for paypal is also discount, and after payment in your orders it’s wrong again and confused about the discount or extra fee. So maybe pay for the extension is the best solution.. This does not work on 1.6.1, the value sent to paypal is positive so you will discount 3.4%, and you will get a notification of possible fraud on that order at magento. Did anyone find a solution to make this work on Magento 1.6.1? I solve this problem going to PayPal (my profile). If you set there Percent % and set for example 3%. All your clients paid with paypal, when arrive at pay page Paypal have the EXTRA FEE of 3%. You have to put a notice in your website to explain this charge as well. Someone have a solution to have a shopping cart surcharge negative rule on magento 1.7.0.0 ? I am looking for the same solution using Magento ver. 1.7.0.1. I know there are extensions available. However, I have no idea what else these extensions are doing. Looking forward to somebody having the ability to solve this issue in most recent version. Normally magento shopping cart price rules calculate on Subtotal. when using the “Percent of Product Price discount” method. This is awesome. Works with EE. Thanks. 🙂 got it : magento 1.7 : go to /app/code/core/Mage/Rule/Model/Abstract.php and edit line No. 94 to 96…. But paypal shows as discount :(… useless trick.. Mine is still showing “Discount (Surcharge) : ” How do i completely remove the discount at the front? Have you followed step 3? Have you cleared the Magento Cache? Try clearing your browser cache as well. ok, this is weird…i solved it, but i had to change the ‘locale’ to english (united states). I’m using english (united kingdom) how do i fix this with united kingdom? i created en_UK and copied the mage_sales.csv files to that folder but still it’s not showing the ammended text. It’s showing discount. When i change it to united states it will show ‘surcharge’ which is the text i ammended. That’s a though one Budi. I don’t know if it’s suposed to be a en_UK file in there. it’s been a while since I played with this things, I’d have to digg about it. If you happen to find an answer to your problem, please post the solution! if i’m using english (united kingdom) would u know where it will load the mage_sales.csv from? I got this code to work in 1.7.0.2, but there is an issue when using it. The amount applied (in this case a negative number, which of course is really a increase in the costs) does not work because the taxes calculated in Magento ignore this increase in price. Tax – (10% here) = $27.99 which is incorrect. Reason, we don’t have tax on shipping. Unfortunately this makes the code in Magento useless unless of course you do not charge tax. After further research, I can say the code is working correctly even though I stated it did not. The discount applied in magento is treated as a non-taxable item. When you put these files in app/local instead of the original magento directories, do you have the create the exact file directory structure in app/local? I tried it and it stopped working, I tried putting the changed files in app/local with the exact structure and that doesn’t work either? I just noticed that while this code works great, it shows as example (-$3.25) on the invoice emails etc.. It is confusing to customers seeing -$3.25 when in fact it is an addition instead. Any way to make it no show the “-“? If you check this comment above http://php.quicoto.com/extra-fee-shopping-cart-price-rules-magento/#comment-736 there’s a partial solution to it. I read that yesterday but in version 1.7.0.2 I cannot find the file where it has that code? The path /app/design/frontend/whatever depends on the theme you’re using. I have looked in every file named items.phtml and that code is not in any of them. The original post was made using an old version of magento and a lot of the filenames and codes changed in later versions. I does not have to necessarily be in a file called “items.phtml”, depends on your theme. There is a lot more code that needs to be modified for this feature to work and display properly. I am not a coder by nature so I wouldn’t know where to start to fix all of these in 1.7.0.2. Here are the items that do not display properly. 1. Sales Order in Admin – Items ordered will show the discount amount as -$.$$ (should not show as “-” when in fact it is an addition). It of course is reading directly from your shopping cart price rules where we put the “-” discount amount for calculations. It would also be safe to say that any of the transactional emails will also be wrong since they just read from Magento code. Customers paying attention to this would think you are trying to do something wrong since things say “discount” but are added to the costs and things show as “-discount” but really aren’t. Hopefully someone who codes will read this and help fix it..
Nice tips. I wonder can we create rules depends on group of customers? Custom price for selected groups like frequent buyers or contractors. Not sure about that. Perhaps you could create different tax groups depending on the customer group. Another approach is to use event observer method which doesn’t not modify or extend any core code. Am using magento 1.8.1 and am new to magento. While I am going to give condition for new rule for shopping cart price rule, if I click (+) icon that page automatically redirect into dashboard. Anyone knows how to fix this problem? It’s been a while since I did this. Have you tried looking into the hole /app/code/core/Mage/Rule folder? But anyway, i can’t do it works in 1.9…..
Do not work on 1.6.1, anyone has a solution? Any ideas on how to do this in Magento 2? I face the problem when I using Magento services for android app. Doesnt work on magento 1.6.x, anyone was able to implement it? Thanks in advance! 4.789.678 post views so far. This page needed 52 queries to load.